Welcome to SICC, the Research group at the University of Valencia on Spaces in Conflict and Crisis. We focus our research in social and environmental conflicts linked to land-uses, as well as to spaces in crisis, such as shrinking regions or abandoned spaces from a perspective of critical geography. Keynote 1 papers: Conflict research theories and methodologies: papers focusing on methodological approaches, states of the art and theoretical frameworks around the concept of urban or spatial conflicts and protests will be welcomed. 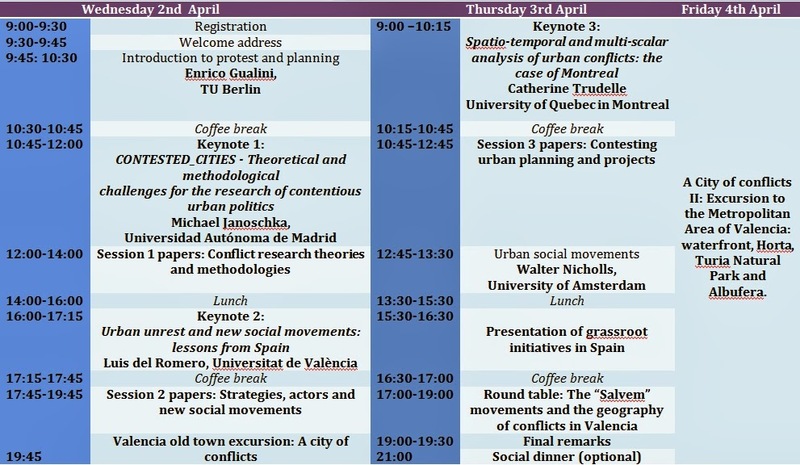 Keynote 2: Urban unrest and new social movements: lessons from Spain. Keynote 2 papers: Strategies, actors and new social movements: papers focusing on actors, strategies and the changing nature of conflicts and participants in conflicts, from NIMBY attitudes to more general and complex protest movements, such as 15M or Occupy the Wall Street movements. Keynote 3: Spatio-temporal and multi-scalar analysis of urban conflicts: the case of Montreal. Catherine Trudelle, Department of Geography, University of Quebec in Montreal (Canada) and Mathieu Pelletier, INRS (Montreal, Canada). Keynote 3 papers: Contesting urban planning and projects: the changing nature of urban planning practices and their influence on public opinion formation, including forms of protest and social mobilization in opposition to planned developments. Reflections or case studies on urban, spatial or locational conflicts. There will be a Round Table (in Spanish) about social urban movements and conflicts in the Valencia Metropolitan Area the Wednesday 3rd April. A brief summary of the interventions and direct translation will be offered for those assistants who do not speak Spanish.